Free weekly episodes in your inbox and MORE! Swipe, drag, or click one of the circles at the bottom to navigate this gallery. Come see what we are up to on the farm. 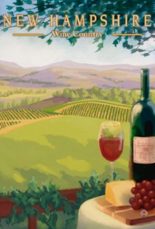 When Julie and her family began hosting Jazz and arts soiree's at their farm, her desire was to touch the dreams of others by deeply engaging in their art and music and by inviting audiences to join her. It's a real place where creative dreams blossom and grow, a place where family and friends gather to share music, art, food and friendship. DreamFarm Radio captures the very real inspiration, warmth and intimacy of these gatherings where fresh, original Jazz-influenced music wafts through the air to awaken the soul. For more about our host, visit JulieLavender.com. New England made. Internationally enjoyed. Enjoy a trip to the farm. Take in the sonic landscape. Julie Lavender brings listeners right into the family barn with its soaring posts and beams and its panoramic view of the countryside. Each week, she welcomes accomplished independent musicians and encourages their dreams, as they perform their music and talk about what inspires them. 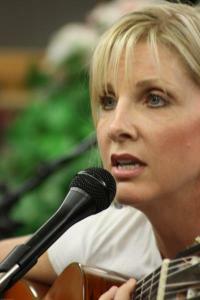 Julie also shares her own music and artistic passion. For more about our host, visit JulieLavender.com. Find out about Julie and the Farm and what inspires the Dream! DreamFarm Radio is Produced and Engineered by Don Richardson of MLC Recording. DreamFarm Radio reaches both music and talk radio listeners. Our audience is creative and curious. They tend to enjoy a wide variety of music and they are also interested in engaging discussions. They enjoy the fresh and sophisticated blend of music we program and find DreamFarm Radio's host, Julie Lavender, to be approachable and winning. DreamFarm Radio is popular with personality driven radio stations and talk formats that offer specialty music programming. Arbitron regularly rates this format category number one with adults 55+ and is consistently a market leader amongst adults 35 and older. The format is considered to be home to the nation's most affluent and educated listeners. DreamFarm Radio nicely appeals to this format class, it's a musical show for both sides of the brain, analytical as well as intuitive. "DreamFarm Radio is Marian McPartland's Piano Jazz meets down-home relaxation. I appreciate Julie Lavender's serene, yet exciting, approach to music and the artists that produce it. Unique, because of its countryside feel, the show is also thoroughly relatable as artists express their art through both words and sound." "Julie and the DreamFarm team are crafting wonderful programs. Beautifully recorded, interesting conversations and, best of all, creative music. DreamFarm Radio has already become a Thursday evening staple for WICN." "From all indications, DreamFarm Radio seems to be a very likable show by our listeners! People will call in from time to time and leave messages... 'that they love what we offer' and typically name several of the shows. Comments are typically of general nature... 'they like this or that show' ...and will always name 'DreamFarm Radio.'" "I just wanted to say how much I enjoy your show. The music on your show is not classically something that I would listen to, but just like all of the best radio shows, the lesson in the genre that I get makes me listen. Every day when I am downloading programs for airplay, I always have one of the shows that I listen to and on Mondays, that show is Dream Farm Radio." "Thank you for your beauty, and your soulful songs, and for making my heart softer and happier. And for sharing the barn, fellowship, friendship, art and music! I will always have a place in my heart for you!" 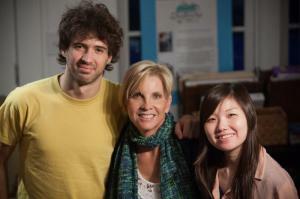 "The DreamFarm Radio program has proven to be truly a special treat and pleasure to listen to. I love that you can tune in, or listen to the archived shows made available. The music here is always top shelf, as [is the show's] host, and added treat, Julie Lavender herself! Good Luck Dream Farm, as I listen and picture myself there, such a beautiful place, truly a journey through sight and sound, a pleasure to the senses, for any listener.... Job well done! Keep it coming!" 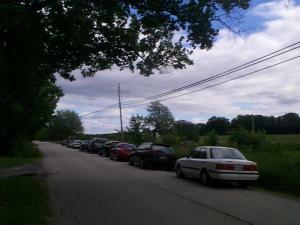 "Had a very pleasant interlude listening in on your DreamFarm Radio program. My first impression, of course, was how wholly entertaining it was. You broke the ice seamlessly with your guest. A very natural sense of hospitality pervades as you both shared, sang, and played. It is a hallmark of any serious musician, not to show the hard work - but only the polish. 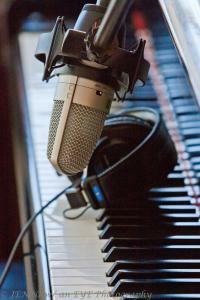 That you do, making it easy to imagine that your accomplished musical guests are regular collaborators and neighbors. It is easy to conceive of myself, and others, tuning-in for the broadcast with a cup of something piping, and an aspirant notion or two. Your show was certainly a delightful encounter, and I am as charmed, informed and impressed as I'm ever apt to be without a ticket stub." These photos of the farm and the happenings here are the work of my dear friend and photographer, Jenni Wheeler. This gallery is dedicated to her in loving memory. She truly was "Jenni with an Eye!" Los Soneros de Las Seis! Sverre Indris Joner Salsa Norway! Grace Kelly Live in Concert "Don't Box Me In"
stellar large Jazz ensemble arrangers "Large and In Charge"
"Sing a Song of Song"
Nick Goumas Quintet "Sing a Song of Song"
Cecilia Zabala, Joe DeLeault and Don Davis "Inspirada"
Yulia Musayelyan and Fernando Huergo "Copper Rose"
some of our favorite soloists and intimate ensembles "Intimate Favorites"
Tucker Antell/Tenor Saxophone "Home Stretch"
Earl Grant Lawrence and Diversions "Little Passion"
Kim Richmond and Clay Jenkins Ensemble "Inner Spirit"
Gerry Beaudoin "There's That Look Again"
"Piano Journeys and Groove Experiments"
Matt Savage "Piano Journeys and Groove Experiments"
Mark Zaleski "Mark in the Park"
DreamFarm Radio's musical Thanksgiving celebration from Julie's New England farm. 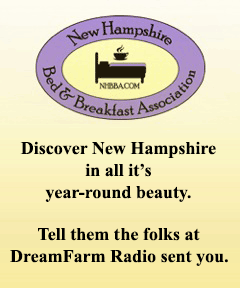 Thanksgiving DreamFarm Radio's musical Thanksgiving celebration from Julie's New England farm. What do dreidels, latkes, overcoming and existential threat all have in common with jazz? Everything! DreamFarm Radio brings you a very hip Hannukah celebration featuring Kenny Ellis's Hannukah album and some of the best big band swing around. Get ready to dig it. What do you get when you cross the sounds and sensibilities of Argentinian composer, guitarist and vocalist, Cecilia Zabala with the talents of two top New Hampshire Jazz musicians? A Synergy-Jazz dream come true. Visit the Cecilia Zabala website. Thanksgiving is our holiday and there is nothing quite like celebrating it at DreamFarm. This collection of some of Julie’s favorite music will enrich your celebration as you give thanks! Café in Nashua, NH. Featuring veteran Jazz players from the LA and Boston areas. 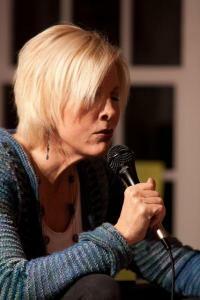 Visit the Kim Richmond with Trio Now website. Boston area pianist, bassist, composer, educator and bandleader, JohnFunkhouser, joins Julie at the farm to share his latest compositions and musical collaborations. Funkhouser takes an active interest in a wide spectrum of music, including all kinds of jazz, from avant-garde to straight ahead to New Orleans Jazz, Brazilian and Afro-Cuban music, folk music of Eastern Europe, the Balkans, and Africa, American popular music, including funk, rock, blues, bluegrass, and hip-hop, Classical from Gregorian chant to 21st century music, Hindustani and Carnatic Classical music of India, Balinese and Javanese Gamelan, and all kinds of hybrids between these various traditions. Find out where he takes us next! Visit the John Funkhouser website. Hot Latin Salsa, and so much more, from this super fun group of excellent musicians we had at the farm. Neighbors dropped by to enjoy the recording session. It was a fantastic party of great music and new friendships. I loved the sounds of the 6 - Los Soneros de Las Seis! Visit the Los Soneros de Las Seis! website. 4 time Grammy Award-Winning cellist and composer, Eugene Friesen who was my guest on DreamFarm Radio along with pianist Tim Ray and trumpet player Greg Hopkins. As if it weren't enought to swim in the vibrations of Eugene's pulchritudinous cello playing, I was treated to their trio sound. Visit the Eugene Friesen website. Bertram Lehman guides our continued exploration of the music of the incomparable Milton Nascimento. Undeniably a Brazilian treasure, this singer-songwriter, composer, instrumentalist and visionary has created music that bridges influences that stem from his beloved Mias Gerais region and far beyond. Milton's music is an intersection of African, South American, and European Baroque traditions, Jazz and Pop. This week we discover the breadth of Milton's music and how his influence spans the globe. Visit the Bertram Lehmann website. Joining us from Oslo Norway, arranger, and composer, Sverre Indris Joner shows off his amazing musicianship. This show will surprise you as Sverre bring together Norwegian and Cuban musicians to transform Norwegian oldies into incredible Latin-Jazz synergies. Visit the Sverre Indris Joner website. 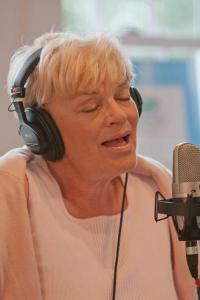 A very special DreamFarm tribute to beloved singer Mili Bermjo. Visit the Milli Bermejo website. Bruce Gertz takes us on a tour of his new recording, “A Different Take,” featuring four renowned Jazz improvisers make use of the malleable structures of Jazz form, harmony, and rhythm to give us a different take on classic sounds. Visit the Bruce Gertz website. This week we begin our exploration of the music of the incomparable Milton Nascimento. Undeniably a Brazilian treasure, this singer-songwriter, composer, instrumentalist and visionary has created music that bridges influences that stem from his beloved Mias Gerais region and far beyond. Milton's music is an intersection of African, South American, and European Baroque traditions, Jazz and Pop. Four masterful Venezuelan musicians bring the musical colors of their enchanting homeland to DreamFarm. Visit the The Venezuelan Project website. This week on DreamFarm Radio we will hear the story of Albanian-born electric bassist, Ervin Dhimo, who grew up under the stifling weight of the Albanian Communist Cultural Revolution. Hearing about his freedom journey creates an essential backdrop for the sound of his "fierce, soulful, funky workouts on jazz, pop, and original tunes." Visit the Ervin Dhimo website. Presenting our first ever live concert recording at Sculler's Jazz Club in Boston: Grace Kelly performing Live at this famed Boston Night Club. We had a blast capturing music from Grace’s 10th anniversary show at Boston’s #1 venue. I also had a ball sitting in with her band to sing that night. Later she came to the farm to talk about her music for our radio program. It’s an honor to share this very impressive young lady’s music with our audiences. Visit the Grace Kelly Live in Concert website. The Why is a chamber-jazz quartet led by Bert Seager, American jazz pianist, composer, recording artist, and educator. The Why also features cello, upright bass, and hand percussion and together reveal new ways to hear dance rhythms from many cultures. The music makes one wonder what Schubert would have sounded like had he lived in Peru and played odd meters, or if Ravel had lived in Ghana and had been able to improvise over chord changes. Visit the The Why website. Two masterful guitarists, Peter Janson and Aaron Larget-Caplan, each with their own distinct musical trajectories, join forces to create an exploration that takes us through jazz, classical, and pop terrains to bring us a world of guitar. 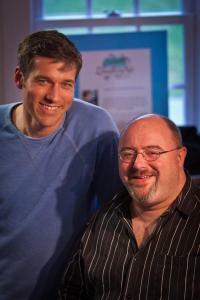 Visit the Peter Janson and Aaron Larget-Caplan website. At DreamFarm we love all the musical "bells and whistles" -- the many and varied textures, tambres, shades and colors of the bigger jazz band. This week we are sharing with your some of the very best Jazz arranging that highlights the wonderful world of the larger jazz ensemble. It's a feast for your ears. Visit the stellar large Jazz ensemble arrangers website. Harmonica master, Roni Eytan brings us Jazz synergies and tribal sounds from the Middle East. It is music that showcases the folkloric styles of North Africa, Andalusia, Israel and beyond. Visit the Roni Eytan Quartet website. The Nick Goumas Quintet is a culmination of the classic Jazz sensibilities, talents, and temperaments of 5 of New England’s best known players. The quintet is a class ensemble Jazz group that performs with energy, feeling and musical integrity. The Quartet's straight ahead style and diplay of rhythmic and harmonic sense produces some exciting jazz improvisation. Visit the Nick Goumas Quintet website. World Percussionist and Ethnomusicologist, Bertram Lehmann, joins me to explore the music of Legendary Brazilian singer and composer, Caetano Veloso. Argentinian composer, guitarist and vocalist Cecilia Zabala stopped by DreamFarm on yet another of her tours of the United States to share her newest CD release, "Foolin' in Time," It's always a feast of incredible songwriting, masterful vocal and guitar work when Cecilia's in the barn. Visit the Cecilia Zabala, Joe DeLeault and Don Davis website. Kimberly Ford is a jazz vocalist whose talent, taste and sensibility both honor, and venture beyond The Great American Song Book... With a stylistic range that effortlessly flows from ballads to Free Jazz, her varied influences include Ella Fitzgerald, Jay Clayton, Sheila Jordan, and Joni Mitchell. Visit the Kimberly Ford website. Yulia Musayelyan is a master of the flute and together with her equally masterful bassist and duo partner, Fernando Huergo, you'll hear elements of tango, jazz, classical and latin folk music that will delight as this duo unleashes their impressive and winning musicianship at the farm. Visit the Yulia Musayelyan and Fernando Huergo website. 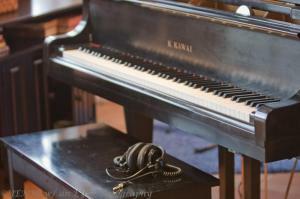 Join Julie on location in LA with stellar studio pianist and gifted composer, Mike Lang. Mike has played on literally 1000’s of hit records and movie and sound tracks. He shares fascinating insights into his life as well as his studio work. Come and explore “all the things” he is. Visit the Mike Lang website. Sometimes the smallest ensembles make the biggest impact, so we've pick some of our intimate favorites for you to enjoy this week - soloists, duos and innovative trios that we love. Visit the some of our favorite soloists and intimate ensembles website. Masterful jazz pianist and composer, Maxim Lubarsky, brings together the stradivarian talents of some of Boston’s finest musicians for a concert at Berklee College of Music. DreamFarm Radio is pleased to present the second part of this extraordinary live event. Visit the Maxim Lubarsky Collective website. This week I am happy to share the music of Venezuelan composer and pianist, Josu Ortiz, and the release of his new CD project, "Black and White Steps." Latin Jazz from a fresh point of view. Visit the Josu Ortiz's Latin Jazz Project website. Imagine Beethoven's Fifth seamlessly fusing with a danceable salsa beat, or Strauss´ Blue Danube as a coquettish cha-cha-cha, yet keeping the essence of the classic piece…Apparently impossible! Doomed to be bad-taste and cheesy! Or is it? Lefteris Kordis Mediterrana project with Roni Eytan on harmonica, Vasilis Kostas on lute, Tamir Schmerling on bass and Noam Isreali on drums. Roni Eytan Quartet with Lefteris Kordis on piano and keyboard, Tamir Schmerling on bass, and Noam Isreali on drums. Visit the Lefteris Kordis website. Tucker Antell is a scorching tenor sax player who is all about The Blues. In this new release, Tucker stretches out across the Blues genre in a way that only someone who is truly at home can do. Visit the Tucker Antell/Tenor Saxophone website. Vocalist, composer and host of DreamFarm Radio, Julie Lavender, shares her new Synergy-Jazz project: “Rising: A Modern Cantata for The World to Come.” This is an unprecedented piece of art featuring glorious spiritual texts set to truly unexpected Jazz infused music, performed by the cream of the crop of studio musicians from L.A. and Boston with arrangements by twice Grammy-Nominated Jazz Orchestra composer, Kim Richmond. We are thrilled to feature this groundbreaking work that is emerging from DreamFarm. Visit the Julie Lavender website. "Diversions" is multiple flutes and saxophones combined with a full percussion section, combining the influences of Afro-Cuban Latin Jazz and the organism of Sun Ra and Pharaoh Sanders. Diversions is riveting! 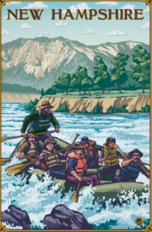 Visit the Earl Grant Lawrence and Diversions website. Boston-based multi-instrumentalist and DreamFarm Radio favorite, Ian Ethan Case, best known for his innovative approach to the 18-string acoustic double-neck guitar is increasingly gaining recognition both for his unique instrumental compositions and for the highly original playing methods which are required to perform them. Ian Ethan is always exploring new sounds and techniques and he shares his duo ensemble with Jarris Yokley and his collaboration with his wife Stephanie who helps sculpt their group's unique sound. Visit the Ian Ethan Case website. Veteran singer, composer, pianist, and entertainer, Bonnie MacLeod joins Julie in the barn for a super fun time doing vocal favorites and character pieces along with her brilliant original solo piano pieces. Bonnie brings her sassy songs sass and sunshine to the farm. Visit the Bonnie MacLeod website. Twice Grammy-nominated composer, arranger and woodwind master, Kim Richmond, is a versatile musician and sought after studio and concert player, based in the Los Angeles area. His first love is jazz, and his primary jazz voice is the alto saxophone. You will love hearing the rich and varied colors of his fabulous collaborative work with Clay Jenkins in their 7 piece jazz ensemble. Visit the Kim Richmond and Clay Jenkins Ensemble website. Boston area pianist, bassist, composer, educator and bandleader, John Funkhouser, returns to the farm to share his more of his latest compositions and musical collaborations. Funkhouser takes an active interest in a wide spectrum of music, including all kinds of jazz, from avant-garde to straight ahead to New Orleans Jazz, Brazilian and Afro-Cuban music, folk music of Eastern Europe, the Balkans, and Africa, American popular music, including funk, rock, blues, bluegrass, and hip-hop, Classical from Gregorian chant to 21st century music, Hindustani and Carnatic Classical music of India, Balinese and Javanese Gamelan, and all kinds of hybrids between these various traditions. Find out where he takes us next! Boston-based multi-instrumentalist Ian Ethan Case, best known for his innovative approach to the 18-string acoustic double-neck guitar is increasingly gaining recognition both for his unique instrumental compositions and for the highly original playing methods which are required to perform them. One of only about five musicians worldwide to tackle the double-neck guitar in earnest, he fluidly combines a variety of self-invented playing techniques necessitated by his multi-layered compositions, which, taken together, have begun to establish the instrument's musical validity perhaps more so than the work of any other artist. Returning to the farm, two masterful guitarists, each with their own distinct musical trajectories, join forces to create an exploration that traverses jazz, classical, and pop terrains to bring us a world of guitar. A special selection of some of DreamFarm Radio’s loveliest love songs. Visit the Valentine Anthology website. Laszlo Gardony is a critically acclaimed artists who has brought his soulful improvisations and compositions to audiences in 26 countries. Called a “great’ pianist by Dave Brubeck, Julie thinks he’s pretty great, too. You’ll enjoy this program in which Laszlo brings his soulful solo piano skills to the farm. Visit the Laszlo Gardony website. Esthema is a progressive music ensemble composed of virtuoso musicians hailing from Boston, MA. Esthema defies musical boundaries and creates their unique sound by blending rock and jazz-fusion with the sounds of the traditional music of the Balkan region and the Near and Middle East. The musicians that shape the sound of Esthema bring together both western and eastern influences, instruments, and concepts, creating a musical tapestry that transcends musical genres and cultures. Veteran East Coast Jazz player and guitarist, Gerry Beaudoin, returns to DreamFarm with his favorite players, Gerard Beaudoin on vibes and Bob Nesky on Bass. Together they give us music that is bubbly, bippin' and toe-tappingly good. This is everything we love about classic small Jazz ensemble celebrations. 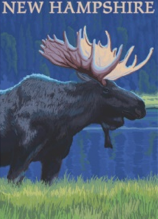 Visit the Gerry Beaudoin website. Jazz prodigy pianist Matt Savage, 24 has recorded his 12th album since he was gained national attention by the time he was a teen and continues to take the Jazz world by storm. He joins Julie to play pieces from his new solo album and also brings his new band “Groove Experiment” to the farm and creates a program of musical contrasts that reveal his many musical abilities and interests. Wow. Visit the Matt Savage website. Internationally touring musician, Mark Zaleski, has distinguished himself as a uniquely dynamic soloist, multi-instrumentalist, and bandleader. He brings his own modern Jazz/Rock fusions to the farm and keeps "our ears on their toes"
Visit the Mark Zaleski website. DreamFarm Radio takes you to a live CD release concert in the historic Amoskeag Mill in Manchester, NH where we are introduced to the music of Fugue Mill. Fugue Mill weaves Jazz through the fabric of Americana, World, and Classical music, creating a complex and pleasing blend of musical and improvisational styles. Original group pieces are featured side by side with music by such composers as Leonard Cohen and Samuel Barber. Violin and mandolin augment the quartet of piano, guitar, bass, and drums, creating a transparent and vibrant palette of improvisation and counterpoint. Visit the Fugue Mill website. Diane Reeves from "Christmas Time is Here"
Nancy Wilsom from "A Nancy Wilson Christmas"
Helen Merrill from "Christmas Song Book"
This week from DreamFarm we bring you a celebration of glorious vocal jazz Christmas songs. It's the sound of Chrismas swinging, grooving and souflfully seranading you like never before. Our gift to you from the farm. Visit the Kenny Ellis website. Don Davis/Saxophones, Flute, Clarinet and…teeth! Don Davis, a friend and frequent guest musician at DreamFarm, has played for us numerous times times as well as performed on several of Julie’s albums. Don plays, soprano/alto/tenor and bass saxophones, various flutes clarinet, percussion and even his teeth! He has performed live and recorded with scores of well-known and accomplished musicians of all sorts. It takes great skill and versatility to contribute to so many different bands so well, while weaving his very own signature sounds and ideas tastefully into the mix. His resume is a road map for a most interesting musical journey that starts right here at the farm. Visit the Don Davis website. Visit the some of our favorite artists website. Chasing epic sax player Jerry Bergonzi down is no easy thing, but well worth the effort. Jerry is an internationally lauded composer, tenor saxophone player, educator and Boston native. When you hear his music you will understand why Jerry receives gets rave reviews wherever he plays across the globe. We couldn’t fit all of Jerry’s music into just one program, so we invited him back for a second show. You will enjoy music from Jerry’s new CD Rigamaroll! Visit the Jerry Bergonzi website. Guitarist and composer, John Baboian has performed around the world and now brings his swinging solo Jazz guitar sounds to the farm. 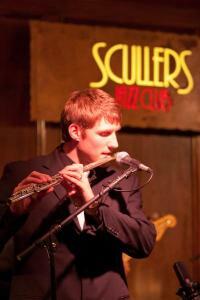 The Boston-based educator and performer has a smooth and winning sound that soothes and shines. Visit the John Baboian website. Rinat Tregerman and Sagit Zilberman are sojourners to the East Coast from Israel. Attracted by the Jazz scene in Boston they came to expand their creative horizons and found a collaboration that spans musical styles and national cultures. Influenced by Middle Eastern rhythms and melodies and the improvisational language of Jazz, they perform together worldwide and bring the sound of Shalom to the farm. Visit the Rinat Tregerman website. Seamlessly blending the sensibilities of classical excellence and precision, Latin folk music and Jazz improvisation, Macayú brings Enchantment to DreamFarm. Eden MacAdam-Somer is one of the most exciting and versatile young musicians performing today. Her music transcends genre through soaring violin and winning vocals. Together with Hankus Nitsky they explore Jazz standards, originals and Jewish folk idioms. Visit the Eden MacAdam-Somer and Hankus Nitsky website. In this program we continue our adventure with Max Ridley, a Boston-based bassist and composer has assembled a plethora of imaginative musicians who take his Jazz creation in and out of expected conceptions. This time we hear more of their influences and sounds, including the tap dancing! They call themselves the Basement Show Philharmonic and we welcome them back to Farm for more phil-harmony. Visit the Max Ridley and Friends 2 website. Norwegian born musician and composer Yngvil is a spirited, multi-talened stage performer and bandleader. She composes and produces music that is Jazz, Blues, Contemporary and Experimental and, very cool. Seamlessly blending the sensibilities of classical excellence and precision, Latin folk music and Jazz improvisation, the Macayú chamber Jazz trio brings enchantment to DreamFarm. Mozambican guitarist and singer Albino Mbie returns to DreamFarm with singer Isabel Novella who also hails from Mozambique. 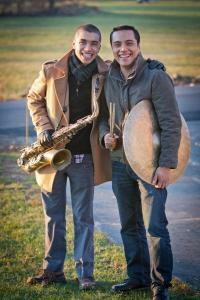 Together they share a rich blend of African sounds and jazz idioms. This week at the farm it's "Moz Jazz" and floating voices. Visit the Albino Mbie and Isabel Novella website. Cellist Catherine Bent and vocalist/guitarist Elis Roseira met in the deep of a New England winter and discovered they were both under the spell of Brazilian music. Their music is truly a taste of the sun. It’s a blend, European Dance Music African rhythms and Brazilian Jazz sounds. Visit the Catherine Bent and Elis Roseira website. Visit the Max Ridley and Friends website. Diversions offers us new insights into to traditional jazz realms of yesterday while combining modern production value perspectives on today. 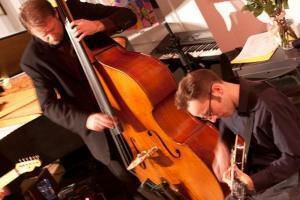 A six-piece modern jazz ensemble with a rich and sumptuous sound. Visit the Earl Lawrence website. 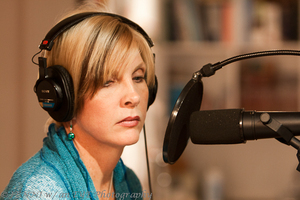 Vocalist, composer and DreamFarm Radio Host, Julie Lavender, shares music from her recent live, in studio concert for one of our fabulous DreamFarm Radio affiliates, WXPR of Rhinelander, WI. Julie was joined by friend and musical colleague saxophonist/ flute player, Kim Richmond for this acoustic, intimate “DreamFarm Live!” happening. Masterful Jazz pianist and composer, Maxim Lubarsky, brings together the Stradivarian talents of some of Boston’s finest musicians for a concert at Berklee College of Music. DreamFarm Radio is pleased to present this extraordinary music to our audiences. Visit the The Maxim Lubarksy Collective website. In this ethereal and melifluous mélange of sound you will hear harp and voice, bass, flute, saxophone, clarinet and recorder. It’s an airy synergy of Jazz harmonies with modern pop music. Acclaimed as "a truly impressive Brazilian Pianist" by the Latin Beat Magazine, Henrique Eisenmann is one of the leading young artists in the jazz scene in New York and Boston, operating a daring fusion of unusual contemporary jazz, free improvisation, folk Latin melodies and classical music. Visit the Henrique Eisenmann website. Great on Paper is an improvised, four-person party of abstract sound fashioners. They go into new musical situations without an exit strategy! Visit the Great On Paper website. Brazilian guitarist, Caio Afiune blends the music of Brazil with more delightful South American sounds that make Jazz voicing sing new songs. 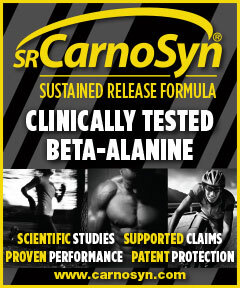 Visit the Caio Afiune website. Visit the Corona Collaboration website. Gypsy Jazz band Ameranouche, returns to DreamFarm to share music from their new CD, “Sunshine Soul.” The guys from Ameranouche always raise the roof in the barn and keep our toes tapping. A scintillating Jazz synergy of acoustic guitar, accordion and saxophone that brings us into romantic spaces and evokes Latin landscapes. Visit the Cassan/ Muratore/Pignataro website. Jazz prodigy-pianist Matt Savage, 24 has recorded his 12th album since he was gained national attention by the time he was a pre-teen, and he continues to take the Jazz world by storm. He joins Julie to play pieces from his new solo album and also brings his new band “Groove Experiment” to the farm. Matt creates a program of musical contrasts that reveal his many burgeoning musical abilities and interests. Wow. Singer-songwriter Julie Lavender, host of DreamFarm Radio discusses her newly released CD, "The Siddur Project." In this project Julie Lavender, sets luminous poetry from the ancient Jewish prayer book to her own fresh, multi-faceted, jazz-influenced music. This intriguing project features top East Coast jazz players and also highlights Julie’s striking visual art. Check out the website to see the art and get a copy of the CD. Thanksgiving is our holiday and there is nothing quite like celebrating it at DreamFarm. This collection of Julie’s favorite Thanksgiving music will enrich your celebration as you give Thanks! This was such a bubbly session…the music really did have a light, happy effervescent quality which was the perfect compliment to a sunny day at Dream Farm. 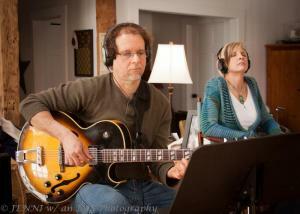 My guest was award winning jazz guitarist, Gerry Beaudoin. Gerry has been featured on over fifty recordings as a leader, co-leader or contributing artist. A consummate jazz and blues guitarist Gerry is also a composer and has recorded almost sixty original compositions in his career. His music has been used on the Learning Channel, Lifetime, NBC and ABC news as well as the Fox News Channel and The Sarah Silverman Show. An active performer across the USA and Canada Gerry is often seen in the company of legendary guitarist Jay Geils of the J.Geils Band, jazz legend Bucky Pizzarelli, guitarist Howard Alden, saxophonist Harry Allen and Grammy Winning Saxophonist and arranger Fred Lipsius from the seminal jazz rock band Blood, Sweat and Tears. He has had his music placed on the Grammy Awards ballot three times in his career. 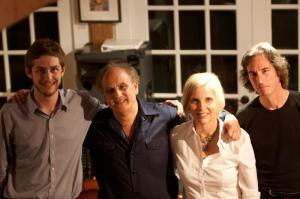 Visit the Gerry Beaudoin Trio website. The Why is a chamber-jazz quartet lead by Bert Seager, American jazz pianist, composer, recording artist, and educator. The Why also features cello, upright bass, and hand percussion and together reveal new ways to hear dance rhythms from many cultures. The music makes one wonder what Schubert would have sounded like had he lived in Peru and played odd meters, or if Ravel had lived in Ghana and had been able to improvise over chord changes. Seamlessly blending the sensibilities of classical excellence and precision, Latin folk music and Jazz improvisation, The Chamber Jazz Trio brings Enchantment to DreamFarm. 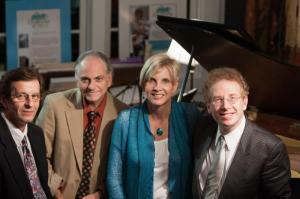 Visit the Chamber Jazz Trio website. At DreamFarm we love eclectic jazz influences but there is nothing quite like Classic trio jazz to bring you home to a happy listening place. And these guys do it with such finesse that it is fresh and new, especially since they write original trio music and have released 2 new albums of it. After many years of playing, recording and writing, these fellows truly shine and it was such fun to have them at the farm. I was taken to new heights as they backed me up on my own trio jazz tune “Velvet Arms of Midnight.” Thank you, Steve, Bruce and Jack. Visit the Steve Hunt website. Chasing epic sax player Jerry Bergonzi down is no easy thing, but well worth the effort. Jerry is an internationally lauded composer, tenor saxophone player, educator and Boston native. When you hear his music you will understand why Jerry receives rave reviews wherever he plays across the globe. It’s an honor to have him on the program. Can’t wait to share his music with our audience. Visit the Fiddle Garden website. A "gifted acoustic finger-style guitar player" Peter Janson brings world-class acoustic guitar music to records and the concert stage with fresh contemporary arrangements of new and traditional tunes from England, Ireland, Scotland, Wales, Brittany, and North America, as well as Celtic inspired compositions. A fusion of Jazz, American roots music, new age and classical sounds, his original and compelling contemporary style is filled with artistry, superb technical mastery, and heartfelt passion: weaving songs about Celtic kings, lost love and sad dogs, memory, life, and the heart. Peter comes to DreamFarm to talk about what is driving him to dig deep and find new inspiration and share some of the highlight of his journey so far. Visit the Peter Janson website. Visit the Yngvil Vatn Guttu website. Visit the Benny Sharoni Quartet website. The Yabuno Ettun Project is a highly creative collaboration between Japanese pianist Haruka Yabuno and Israeli bassist Ehud Ettun. Each one an imaginative composer, Ehud and Haruka have created, during the past few years, a unique interaction on stage. Their performances have also been described by listeners as "captivating" and "fascinating." Visit the Ehud Ettun and Haruka Yabuno website. Beau D'Ver is a collective of improvisers based in Boston that seeks to blur the lines between composition and improvisation, comedy and concert Jazz music. This show with Beau D'Ver is a perplexing and engrossing adventure. Visit the Chris McCarthy and Beau D'Ver website. Ah the voice, so personal and intimate. Some of the sweetest moments at the farm are those surrounded by the voices of our talented artists. Here are a few of those moments. 4 time Grammy Award-Winning cellist and composer, Eugene Friesen who was my guest on DreamFarm Radio along with pianist Tim Ray and trumpet player Greg Hopkins. As if it weren't enought to swim in the vibrations of Eugene's pulchritudinous cello playing, I was treated to their trio "Tre Corda." A previous guest musician in Season 1 of DreamFarm Radio, Vivkek Patel, was at that time young Jazz trumpet player in Boston with a lot of promise. A physical condition, due to which he lost motor control in his right hand, changed his trajectory. In this episode of DreamFarm Radio we talk to this gifted musician and find out how he is creating a new music in different ways. Visit the Vivek Patel website. Pianist Steve Hunt, throughout his career, has stayed true to an uncompromising vision of composing and performing Jazz music from his heart. Steve has continued to push himself technically, focusing on a musical styl which is both challenging and meaningful. Steve's desire towards challenging himself is nowhere more evident than with his long time association with Allan Holdsworth, whose progressive and innovative style has helped Steve to further his own musical development. Steve continues to compose and study and grow. His technique is masterful and his music is tasteful and melodious. Truly. Max Ridley is a Boston-based bassist and composer who has assembled a plethora of imaginative musicians who take his Jazz creation in and out of expected conceptions. You’ve got to hear all the sounds, including the tap dancing! They call themselves the Basement Show Philharmonic but it was a Barn Show Full Harmony experience in their first show at the farm. Visit the Max Ridley and Friends 1 website. New York saxophonist Daniel Bennett has been hailed as one of the most original and unpredictable musical voices of his generation. Insite Magazine calls Bennett's music, "refreshingly capricious and trippy." The Village Voice raves, "saxophonist Daniel Bennett makes hay with an airy approach that's buoyant enough to conjure notions of East African guitar riffs and Steve Reich's pastoral repetition." 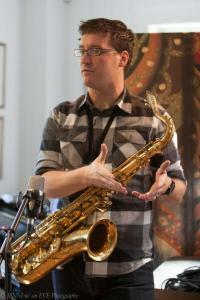 The Boston Herald describes Bennett's music as "exploratory Folk-Jazz hybrid." Timeout New York raves, "Daniel Bennett airs his lilting, potentially hypnotic compositions!" Check out this episode featuring Recorded Daniel Live in Concert for this very special episode of DreamFarm Radio. 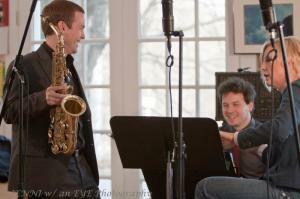 Visit the The Daniel Bennett Quartet website. A listen-back to the rich and varied string vibrations that have permeated the atmosphere at DreamFarm. This young musician has a beautifully crafted style with a fetching voice and a way of interpreting melodies that is fresh, adventurous and evocative. Together with her husband, Lefteris they form a fearless and seamless duo. I loved Panayota’s voice and the way she intuited new places to go in familiar songs. Her interpretations made each song a brand new journey rather than just a familiar ride down a musical road. 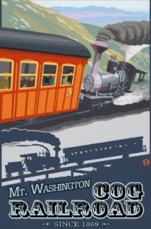 Take the trip with us. It all starts right here at DreamFarm with Panayota Haloulkou. Visit the Panayota Haloulakou/Lefteris Kordis website. In this ethereal and lovely mélange of sound you will hear harp and voice, bass, flute, saxophone, clarinet and recorder. It’s an airy synergy of Jazz harmonies with modern pop music. Fugue Mill weaves jazz through the fabric of Americana, world, and classical music, creating a complex yet attractive blend of musical and improvisational styles. Original group pieces are featured side by side with music by such composers as Leonard Cohen and Samuel Barber. Violin and mandolin augment the quartet of piano, guitar, bass, and drums, creating a transparent and vibrant palette of improvisation and counterpoint. This week’s DreamFarm Jazz synergy is a culmination of the classic Jazz sensibilities, talents, and temperaments of 4 of New England’s best known players. Heading the band is Nick Goumas, whose steadfast dedication to the Jazz of the early to mid 60’s informs his own original music and his interpretations of the greats. Julie welcomes Nick and his band into the barn for yet another day of swinging dreams. Visit the The Nick Goumas Quartet website. What happens when fresh creativity is loosed on sublime standards? Rearranging Magic. Here how DreamFarm Radio guests have arranged and rearranged some of the music we know and love. Guitarist, singer, composer Cecilia Zabala was born in Buenos Aires, Argentina in 1975. She is guitarist, singer and composer Through out her career, she has expressed her musical creativity using her guitar and her voice, creating original compositions that blend sensitivity, emotion, technique and intuition. Her music draws on a rich mixture of influences, from Argentinian folklore, the contemporary language of the twentieth century, jazz, tango, and Brazilian music. In this unusual DreamFarm show, here how Cecelia connected with New Hampshire musicians, pianist, Joe Deleault wind player, Don Davis and learn how their collaboration has spanned the continent and the musical sensibilities of the Americas and hear how it all intersects at DreamFarm. Visit the Cecelia Zabala website. Visit the Anthony Fung Quintet website. Vocalist, composer, educator, Latin music and Jazz specialist. Professor at Berklee College of Music since 1984, where she teaches Jazz improvisation, Latin music, performance, and voice technique. 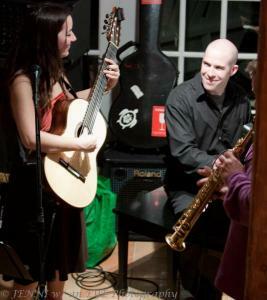 Mili performs with her husband and bassist, Dan Greenspan. Together they are the perfect duo, combining voice, and strings, and expressing the aesthetic of Jazz with the colors, textures, rhythms and poetic content of the music from Latin America. Dan Greenspan plays the double-bassist with a passion that makes the textures and moods of the music almost palpable. His capacity to provide both the root and the melody of the music is at the core of his creative playing. Visit the Mili Bermejo and Dan Greenspan website. Boston-based multi-instrumentalist Ian Ethan, best known for his innovative approach to the 18-string acoustic double-neck guitar, has been performing in small listening venues around the country for the past six years and has now gained national recognition both for his unique instrumental compositions and for the highly original playing methods which are required to perform them. Julie welcomes, Ian Ethan Case back to the farm to hear about his latest work and join him on one of his newest compositions. Referencing the exotica of composers ranging from Tchaikovsky and Shostakovich to George Gershwin, Martin Denny, and John Adams, Mr. Ho's Orchestrotica—as a vibraphone quintet—performs global jazz and exotic chamber music with world-music flavors sourced from Asia, the Middle East, the Balkans, and Latin America. Led by multi-percussionist, vibraphonist and composer Brian O’Neill, the group also features bass flute/woodwinds (Geni Skendo), percussion (Shane Shanahan), acoustic bass (Brad Barrett), and oud/tanbur/resonator guitar (Tev Stevig). The quintet focuses on original music written by O'Neill ("a first-rate composer"—Huffington Post) that is highly influenced by his fifteen-year career as a multi-percussionist in symphony orchestras, jazz groups, and world music ensembles leading AllAboutJazz to say, "…if John Zorn is an exotica Picasso, O'Neill is his Georges-Braque counterpart in cubism's transposition to music." The Orchestrotica was named the 2012 "Best World Music Act" in the Boston Phoenix's annual readers' poll. Visit the Mr Ho's Orchestrotica website. Mozambican guitarist and singer Albino Mbie returns to DreamFarm with singer Isable Novella who also hails from Mozambique. Together they share a rich blend of African sounds and Jazz idioms. Moz Jazz and floating voices this week at the farm. For the celebration of his 21st birthday, jazz pianist Matt Savage has released his 10th album! He has already been connected with some of the biggest names in jazz from the time he was first labeled a "jazz prodigy" at age 8. He has performed (on stage and in jam sessions) with the Ellington All Stars, Chaka Khan, Wynton Marsalis, Joshua Redman, The Bad Plus, Arturo O'Farrill, John Pizzarelli, Clark Terry and Chick Corea, just to name a few. Matt who on his way to New York City to continue his studies continues to amaze and it was so fun to have him back at the farm talking about his new project. Julie's special guests perform music with Latin influences from Brazil, Italy and South America. Guest musicians include, guitarist Sergio Brando, pianist and vocalist Ferdinando Argenti and the saxophone /piano duo Joe Deleault and Don Davis in their collaboration with South American guitarist and singer, Cecelia Zabala. Composer/pianist and Chicago native Brian Friedland's music displays a relentless creativity and open-mindedness that is quickly evident when one examines his written repertoire. A composer from age 13, his output consists of 8 big band charts, 12 chamber works, a film score, and hundreds of compositions for small and large jazz ensembles. In addition to writing music drawing on mainstream jazz and classical traditions, Friedand's pieces include diverse instrumentations and unusual ideas. 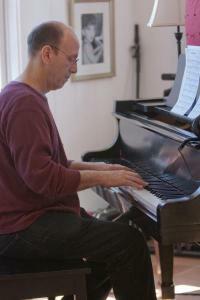 Friedland studied with jazz composers Vince Mendoza and Kim Richmond and pianists Shelly Berg, Allan Pasqua, and Danilo Perez. He has a master's degree in jazz composition from New England Conservatory and a bachelor's degree in jazz performance from the University of Southern California. 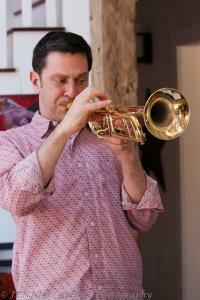 He comes to DreamFarm with a full, rich horn section and lots of amazing ideas to share. Visit the Brian Friedland website. Julie invites listeners into her family's Thanksgiving experience with the music and sentiments that fill the farm on their favorite holiday of the year. It's a one-of-a-kind holiday program of Jazz synergies, vintage songs, historic themes and exhuberant expressions of gratitude. An instrumental ensemble hailing from Boston, MA (USA), Esthema has been creating their unique sound since 2006 by fusing the sounds of Jazz/Fusion and Progressive Rock with the sounds of the traditional music of the Balkan region and the Near & Middle East. The musicians that shape the sound of Esthema bring together both Western and Eastern influences, instruments, and concepts creating a musical tapestry that transcends genres and cultures. Presenting our first ever live concert recording: Grace Kelly performing Live at Sculler’s Jazz Club in Boston. We had a blast capturing music from Grace’s 10th anniversary show at Boston’s #1 Jazz Club. I also had a ball sitting in with her band to sing that night. Later she came to the farm to talk about her music for our radio program. It’s an honor to share this very impressive young lady’s music with our audiences. Cabaret singer, Lynda D'Amour discusses her interpretations of jazz standards and her original songs. She was a delightful guest and it was great to discover more about the creativity the the cabaret genre and hear Lynda's honeyed vocals. A treat. Visit the Lynda D'Amour website. David Tonkin’s Group brings us original Jazz pieces the open up like windows into popular Jazz grooves. David calls himself a “Blue Collar” Jazz player….a guy whose work in music is all play. He been playing, teaching and performing for over 40 years. I loved his take on the Jazzy idioms he opens up for us. You’ll like hearing the work of this experienced Jazz man and his seasoned band. Visit the Dave Tonkin Group website. Highly acclaimed Boston classical guitarist, John Muratore, has appeared extensively across the US, Canada, Europe and Russia and he came to DreamFarm to play gorgeous guitar music. We explore classical guitar repertoire that is touched by jazz idioms. It's fascinating to hear those sounds flowing from John's fingers. I took my favorite place on the barn floor to listen intently. (I find myself there a lot when players come to record for the show.) Take your favorite place and listen to his show. Visit the John Muratore website. European Bass Player Ervin Dhimo presents his dynamic jazz-funk-fusion project THE ERViN DHIMO TRIO, featuring World renowned jazz pianist, composer and jazz educator, Steve Hunt and prodigy Percussionist/Drummer Vancil Cooper. Visit the Ervin Dhimo Trio website. It was a real singer’s celebration at the Farm when Louise Van Aarsen came with her talented friends and comrades. The music composed and sung by Louise may best be described as "grown up music for grown ups." Her subjects are time, love and loss and desire. She is not afraid of singing of domesticity, children and happiness. These subjects are all cushioned in thoughtful arrangements tending toward the southern hemisphere and hyper-exact contemporary jazz production. Louise’ voice is no-nonsense and very easy on the ear. Her band is top notch. .Singer Ted Davis and producer Parris join Van Aarsen and the three create dancing vocal counterpoint to great effect. 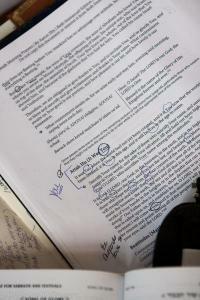 Louise’ writing plumbs the depths of the commonplace while making them not seem such. The fields of the farm were alive with the singing! Visit the Louise Van Aarsen website. Maxim Lubarsky is a pianist with a rare spectrum of talent and virtuosity. Equally comfortable performing jazz, classical, and music of Latin America, he is a truly remarkable arranger, composer and performer. 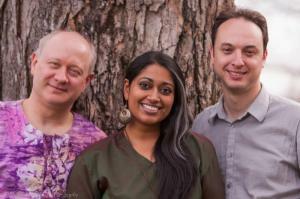 He is joined at DreamFarm by master percussionist and drummer, Bertram Lehmann and vocal phenom, Annette Philip. Together they form a truly unparalleled trio each exploring the percussive and melodic landscapes of their instruments taking us to unexpected new places. Jazz pianist, composer arranger, Mark Shilansky assembled a fabulous group musicians combining horns and guitars and keyboards, piano, bass and drums. This versatile group performed intricate arrangements that brought out the best of all their many talents. Cool originals filled the barn showcasing the unique combination of piano, keys, horns and guitars, and so much more. Visit the Mark Shilansky and Dave Newsam website. 4 time Grammy Award Winning cellist, Eugene Friesen was my guest for this episode of DreamFarm Radio along with pianist Tim Ray and trumpet player Greg Hopkins. As if it weren't enought to swim in the vibrations of Eugene's pulchritudinous cello playing, I was treated to their jazz chamber music trio, Tre Corda. "Tre Corda" refers to classical piano notation, and is an instruction to the pianist to the release of the soft pedal which allow all three piano strings vibrate freely. This trio's members are free to explore their own creative paths and fully resonate as individual musicians in free and yet collaborative expression. That's "Tre Corda!" Visit the Tre Corda website. Internationally known, Grammy nominated alto saxophonist, orchestra leader, composer and arranger, Kim Richmond joins Julie to share his latest recording “Artistry.” Artistry is Richmond’s tribute to one of the most innovative bandleaders in jazz, Stan Kenton. While that is certainly noteworthy, there's much more here than memories. Augmenting the traditional big-band structure Kim’s amazing orchestral arrangements, creatively written originals and terrifically performed charts Kim Richmond and his orchestra group deliver an outstanding performance. It’s a thrill to have Kim come and share his new recording and play live with Julie for this episode of DreamFarm Radio. Visit the The Kim Richmond Jazz Orchestra website. Albino Mbie was born in Maputo, the capital of Mozambique, a country in southern Africa known for its rich musical and cultural heritage. Fueled by the resourcefulness and determination that have always characterized Mozambicans, he built his first guitar at 16 from a 5-liter can of oil, scrap wood, and strings made out of electrical cords. As with his home-made guitar, Albino wanted to combine styles and incorporate diverse elements in his music. Today, Albino’s music succeeds in combining many disparate parts into an organic whole. It incorporates his musical experiences from Mozambique, the U.S., and many other places around the world, combining rhythmic patterns and musical concepts to create a unique "Moz-Jazz" sound. Visit the Albino Mbie website. The six members of Amethyst have joined their love of contemporary jazz, acoustic pop, and various Latin genres with undeniable skill and taste. The unique voice of each musician enriches improvisational arcs throughout every performance. Featuring Rivera’s originals, as well as collaborative cover arrangements, this group delivers accessible interpretations of human feeling as well as delighting the ears. Visit the The Amethyst Group website. The Yabuno/Ettun Project is the incredibly melodic, intuitive and sensitive music of Ehud Ettun on bass and Haruka Yabuno on piano. I soaked in their music and it was a delightful afternoon..
Visit the Yabuno/Ettun Project website. The musicians of Trio Por Do Sol are modern practitioners of a tradition that's about 140 years old but continues to be re-defined. At its very core, Choro is a hybrid style, with roots in Europe and Africa. Brazil claims Choro as its first own urban music (from Rio). It's also very important to Brazilian identity, which is profoundly multi-racial. Currently, choro is practiced along a continuum of tradition and modernity, and the music has been blended with jazz and bluegrass and klezmer and even baroque music. In most contexts, it is a vehicle for improvisation, although the expectations are somewhat different than in jazz. We have a repertoire that mixes old and new choro compositions; we create our own arrangements and improvise around these forms. Fresh and fascinating music. Visit the Trio Por Do Sol website. Even if you've never heard of composer/pianist Peter Primamore, there's a good chance you've heard his award winning film and television scores. Having built an extensive resume as a commercial composer, Primamore has produced Grancia, an ambitious and highly personal collection of original music, mixing the intimacy of a chamber ensemble with a high energy jazz-fusion rhythm section. “Primamore” means First Love. We invite you to enjoy Peter’s musical first love- the music he shares with us on DreamFarm Radio. Visit the Peter Primamore website. 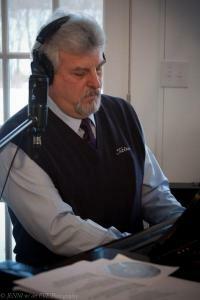 Jazz pianist and composer, John Funkhouser, was recent guest on DreamFarm Radio﻿. Loved hearing tracks from his new Cd, "The Still" which explores space and sound and deep new places of creativity. "The Still" features Mike Connor﻿ on the drums and Greg Loughman﻿ on bass. As always, it's great music. This show features more of our favorite musical moments from the past season. Enjoy! Julie Lavender continues to reveal the world of DreamFarm with this behind the scenes episode in which she shares more of her own music, creative influences and life at the farm. Julie talks with engineer Don Richardson inviting listeners find out more about what makes DreamFarm Radio a feast for the ears. Visit the Kim Richmond website. Veteran drummer, percussionist, educator and ethnomusicologist, Bertram Lehmann brings percussion instruments from across the globe to DreamFarm. In this intriguing episode, he demonstrates how percussion is employed around the world, not only rhythmically, but tonally and melodically as well. He adds his own percussive expertise to live music performed at the farm and shares some of his recorded collaborations demonstrating his work with a variety of regional musicians of all sorts. This truly is a world percussion exploration. This show features some more of our favorite moments from the past season. Enjoy! Visit the Grace Kelly website. Singer, Songwriter, and DreamFarm Radio host, Julie Lavender, takes her audience behind the scenes of the show and life at DreamFarm, her New England country home. She talks about what inspires her own music and the creativity and art that flows in the midst of family, school, community, live performances, and radio recording sessions at the farm. This show features some of our favorite moments from the past season. Enjoy! The David’s Group brings us original Jazz pieces the open up like windows into popular Jazz grooves. Tracy Clark, a proud Bostonian, has been singing in and around Boston since she was 19. In her late 20’s, Tracy’s music career included living and gigging in NYC before settling back down in Boston to raise her now teenage son. Tracy is back on the scene with a vengeance. With a voice reminiscent of Diana Krall, yet distinctly her own, Tracy draws her audiences in with her intimate approach to the stories she sings and is sure to have you swinging to songs that highlight how much fun she has being on stage. Tracy is joined by some of Boston’s most accomplished and innovative musicians, Bob Christopherson on keyboards and arrangements, Greg Holt on bass and Casey Scheuerell on drums. Tracy and I had a ball singing together. What a fun afternoon. 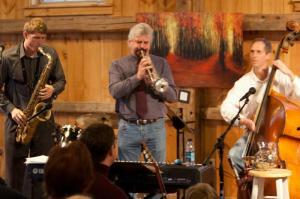 Tracy and the guys brought warm moments and sweet music to the barn. Hope you enjoy it. Visit the Tracy Clark Band website. Truly a collaborative and original band. With influences from Israel, Turkey, South America Asia and America. I loved working with them on their music as well as mine. Julie welcomes singer/songwriter Joy Mover to DreamFarm to celebrate the release of her upbeat, self-titled debut CD. A Boston native, Joy demonstrates her ability to craft engaging original music and her uncanny knack for attracting incredible musical talent to help her realize her vision. Full of numerous influences and tastes, Joy’s music spans the East Coast spectrum from urban jazz and pop grooves to the Miami Latin jazz scene, bringing it all into the barn at DreamFarm Radio. Visit the Joy Mover website. Double-knecked guitarist, Ian Ethan Case is also releasing a brand new album of music based up on his explorations on the kalimba....an african thumb piano. He shares that music with us along with his new guitar works. Drawing on a diverse musical background that saw him taking piano lessons at the age of five and later studying drumset, orchestral percussion, saxophone, electric guitar and bass, Ian Ethan’s strikingly-unconventional, self-invented approach to the double-neck guitar is both magical to hear and fascinating to watch. And while his performances are visually intriguing to say the least, it is not showmanship but rather the sincere desire to accurately communicate the harmonically rich, multi-layered music of his composing (or “discovery”, as he refers to the process) that has impelled him every step of the way. In this episode we explore the masterful music of Cassan and Muratore. The duo is known for their arrangements of classical and contemporary music, which combine the intimacy of chamber music with the spontaneity and influences of jazz. It’s another auditory feast as we the experience the divergence and the commonality of various musical streams. Visit the The Duo of John Muratore and Roberto Cassan website. Visit the Marlene del Rosario website. Bassist, composer and bandleader Ehud Ettun is only 25, and has been "making a splash into the US and world Jazz scene" (Boston Globe) and described as "One of the top five Bassists in New York" by Bluemonk Moods. His unique approach to the Bass quickly made him on demand both as a bassist and bandleader all over the world. The Ehud Ettun Group was founded in 2009 by Ettun and have been playing together since. They started playing in smalls places in Jerusalem and Tel Aviv, but their unique sound as individuals, together with the years of playing together quickly garnered them bigger and bigger audiences. Ehud Ettun coms to DreamFArm with his quartet. 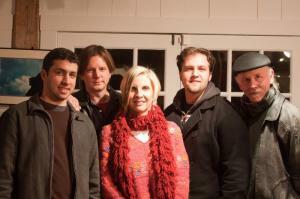 Their music is a blend of influences from classical, ECM Jazz, and world music - creating different textures and sounds. The special connection between players Lihi Haruvi/Sax, Natti Blankett/Drums, Haruka Yabundo/Piano and Ehud allows the music to be played freely and in a more abstract approach. Visit the Ehud Ettun Quartet website. Visit the The Fretful Porcupines website. Born in Brussels, Belgium in 1973, Zeke Martin entered the world with a pair of drumsticks in his hands. As child, he had a strong appreciation for diverse musical styles such as Jazz, Funk, Reggae and Rock, and was heavily influenced by his father, the late Stu Martin, who played with Jazz royalty including Herbie Hancock, John McLaughlin, Charles Mingus, Dave Holland and Quincy Jones to name a few. Now known for his own drumming chops and unique style, Zeke Martin has carved out his own musical path which has led him to create a fresh funk-jazz style that he explores with his band on "The Zeke Martin Project 4" which just won Best Jazz CD at the New England Music Awards. When Zeke and his band join Julie to share their music, it's a hip funky-farm thang. Visit the Zeke Martin Band website. At age 19, pianist Matt Savage has already been connected with some of the biggest names in jazz from the time he was first labeled a "jazz prodigy" at age 8. He has performed (on stage and in jam sessions) with the Ellington All Stars, Chaka Khan, Wynton Marsalis, Joshua Redman, The Bad Plus, Arturo O'Farrill, John Pizzarelli, Clark Terry and Chick Corea, just to name a few. Matt who is graduating from Berklee College of Music in Boston, brings 2 incredibly talented Berklee College graduate performers friends to the farm to join in him making some very special music. Visit the Matt Savage Collaboration website. The Spontaneous Architects was started in the spirit of the nu-jazz movement, which weaves modern beats and styles into the fabric of improvisational jazz. The ensemble is comprised of strong soloists that all play with a great deal of passion and energy that creates an exciting, engaging experience for the audience. Original music composed by saxophonist John Vaillancourt, a veteran performer who has recorded dozens of CDs as a sideman and leader and has played at jazz festivals and clubs throughout the Northeast. The compositions range from deep funk grooves to world jazz beats, and they're based on interesting yet accessible harmonic structures. The combination of the trumpet, sax, and acoustic bass evoke the classic jazz quintet sound of the hard bop era, yet the band's sound is entirely modern and fresh. Enjoy nu-jazz sounds from the farm. Visit the Spontaneous Architects website. Davis and Deleault's music has touched audiences across the globe ranging from individual tours of the U.S. and Europe to sharing the stage with multi-Grammy winning artists including festival venues like the JVC, Montreal, Kool, Berlin, and many others. TV appearances on VH1 and various movie/sountracks. When describing the music of Davis and Deleault, one critic wrote, "Don Davis displayed a mastery of bass clarinet, alto and soprano saxophone, and achieved the same flexibility and excellence at improvisation with different timbres. Joe Deleault played with equal technical mastery and innovation on an instrument that can provide much rhythmic, melodic, and harmonic variety." The duo's recording credits include The Microscopic Septet, LL Cool J, Jon Bon Jovi, Mighty Sam McClain, CJ Chenier, Danzig, Tribute to Monk, and many others. Playin' at DreamFarm with Julie, they celebrate their talents and creative collaboration, and perform selections from their latest CD release "Davis and Deleault." Visit the Davis and Deleault website. Formed in late 2008, Two Worlds is a latin inspired jazz collaboration between some of the best musicians on the East Coast. They're original compositions make them stand out from many other groups of the same genre, combining melodic lines with sophisticated jazz harmony and danceable latin grooves from Brazil, Africa and Cuba. 'Stream of Stars', they're debut release, perfectly captures on record the sounds and moods created by the ensemble when they perform live. The members of Two Worlds are some of the most proficient, inspired and experienced improvising musicians playing today. Pianist Michael Shea, drummer Rodrigo Bonelli, bassist Jeffrey McAuliffe, and flute/sax player Karas Peyton visit DreamFarm and fill the atmosphere with the sounds of Two Worlds. Audrey Silver is one of the most elegantly creative singers in jazz today. 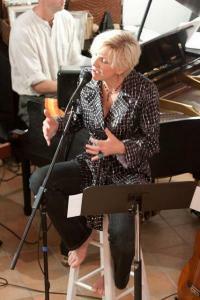 She is known for her smooth, effortless sound and unique approach to the American songbook. Based in New York City, Audrey has performed at the Tanglewood Jazz and at New York's prestigious JVC Jazz Festival. Audrey sings with a style that radiates her warm, generous personality. She also has a unique approach to songwriting and unravels her creative journey during an afternoon at DreamFarm. Together with Julie they sing and talk together about all that jazz. Visit the Audrey Silver website. 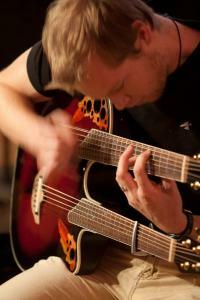 Acoustic Double-Neck Guitarist Ian Ethan began a journey into truly uncharted territory when he picked up this seldom-seen 18-string instrument in 2005, two years after leaving the Berklee College of Music. While most who venture to play the instrument are either baffled by or unaware of the possibilities that it offers (its history seems to peg it as more of a grandiose stage prop than a valid musical tool), for him it is simply "the most effective and intuitive means I've found to translate into sound the things I'm hearing in my head." Drawing on a diverse musical background that saw him learning piano, drums, saxophone, electric guitar and bass beginning at the age of five, Ian Ethan's strikingly-unconventional, self-invented approach to the double-neck guitar is both magical to hear and mesmerizing to watch. And while his performances are visually intriguing to say the least, it is not showmanship but rather the sincere desire to accurately communicate the harmonically rich, multi-layered music of his composing (or "discovery", as he prefers to refer to the process) that has impelled him every step of the way. Ian Ethan "unpacks" his craft during his recent visit to DreamFarm providing our audience with unique insight in to his amazing music. Blending the virtuosity of modern Jazz with his musical roots of Brazil, guitarist and composer Sergio Brandão weaves sophisticated forms and textures into a vibrant, simple fabric of folk traditions. With his ensemble, Banda Lua, Brandão has orchestrated a paean to his homelands rhythmic diversity and fire. Sergio leads a group of authentic musicians on a contemporary exploration of Brazilian musical styles. It was a delight to hear the music of Banda Lua drifting across the landscape of DreamFarm. Visit the Sergio Brandao website. Ferdinando Argenti, Boston-based pianist/keyboardist/ vocalist/ composer/ arranger, was born in Pisa, Italy, in 1954. At age 7, this multi-faceted artist began studying piano until he entered high school, during which time he gained experience playing with Italian rock bands (although in the meantime listening to his father's American swing records ), and even won a national musical contest and appeared on Italian television. He continued to play music while a student of languages at the University of Pisa. 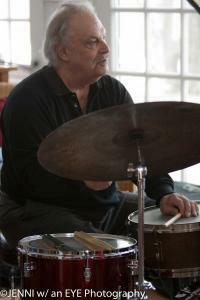 In 1984 , he left Europe for the United States, where he furthered his jazz education. During this period, Argenti returned to his native Italy to perform in many jazz concerts with both Italian and American jazz musicians, most notably Chet Baker, Lee Konitz and Kenny Wheele . Among the Italian jazz musicians he played with, we should mention Massimo Urbani, Paolo Fresu, Marcello Rosa, Gianni Basso, Flavio Boltro, among others. Ferdinando Argenti's brilliant jazz piano sound and improvisational style are a composite of Charlie Parker's be-bop, Oscar Peterson's blend of bop and swing, the lyrical approach of Bill Evans and Chet Baker, and some of the harmonic innovations and rhythmic feel of Herbie Hancock and Chick Corea . Argenti's sensitive vocal phrasing and delivery can be largely attributed to his admiration for Frank Sinatra and Chet Baker. Ferdinando share his original music along and Jazzy Italian Popera tunes with our DreamFarm audience. 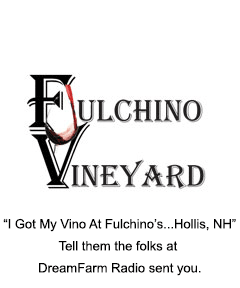 Visit the Ferdinano Argenti website.